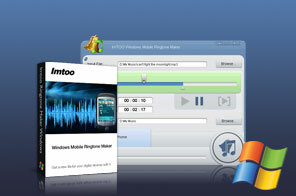 With ImTOO Windows Mobile Ringtone Maker, you can make your own ringtones from almost all video and audio formats including AVI, MPEG, WMV, DivX, MP4, H.264/AVC, AVCHD, MKV, RM, MOV, XviD, 3GP, WMA, WAV, RA, M4A to MP3 file as your Windows Mobile device ringtone. Besides, this mobile ringtone converter is capable of transferring MP3 ringtone to your Windows Mobile device. Convert music files including WMA, AAC, WAV, CDA, OGG, FLAC, APE, CUE, M4A, RA, RAM, AC3, MP2 to MP3. Extract MP3 music from any videos like AVI, MPEG, WMV, DivX, MP4, H.264/AVC, AVCHD, MKV as ringtone. A great variety of Windows Mobile devices are fully supported. Make ringtone for your device now! Auto transfer the converted ringtone to your Windows Mobile device when completing ringtone creation. Trim your media file, define the start and the end for your desired segment and convert it to MP3 ringtone. The built-in music player allows you to pre-listen your loaded or trimmed file before converting it to MP3. The ringtone maker provides multiple language interfaces: English, German, Japanese and Chinese. Easily make Windows Mobile ringtone just with a few clicks due to the concise interface and sound design. Record a wind howl, friends' sing or kids' laugh, doorbell, or any sound and convert it to your ringtone. Tutorial : How to make MP3 ringtone from video or music file for Windows Mobile phones using ImTOO Windows Mobile Ringtone Maker?